Clack is a virtual network environment for visualizing network behavior and router internals. Targeted for undergraduate students, Clack's intuitive UI and Java implementation makes it easy to use for in-class demos, "lab" homeworks, or as a network programming platform. Please note: Clack is no longer actively developed or maintained. The source code is available on Github and we will endeavour to help users with questions who file issues on Github. If you are an instructor looking for the instructor-only resources for various assignments (e.g., automated test code), please email info (at) clackrouter.net . More than 6 different universities have successfully used Clack with undergraduate networking courses. For details on currently available assignments, see the Clack Introduction and Instructor Resources pages. Please contact us (info (at) clackrouter.net) if you are interested in using Clack. We are still open to working on new features to support new assignments. Using Clack as a student is usually quite simple, and the demos below can help you grasp the basic uses easily. Please read our quick and graphical Introduction to Clack . Feel free to play with some of the demos below too. You can try out Clack right now without installing anything! Here are a few demos, more coming soon! Basic Clack: Route live Internet traffic in your browser! Comments? Suggestions? Please email us at feedback (at) clackrouter.net ! Clack is open source and fun to hack on. The Clack Development page tells you more about potential projects. Clack Introduction A description of basic and advanced Clack features (last updated Feb. '07). Clack Visualization Paper A 9-page write-up summarizing Clack (presented at ACM SoftVis Sept. '06). Clack Honors Thesis Detailed description of the original Clack design (May '05). Developer Documentation Describes how to extend Clack with new functionality (last update March '06). 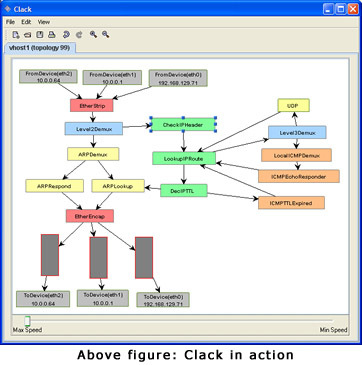 Clack is built on top of the JGraph Java library and is available under the GNU Public License. Note: No download is needed to run Clack unmodified. You can simply try the demo now. Downloading the binary file is only needed if you plan on adding functionality to Clack as described in the developer documentation. The source code is provided for those interested in learning the API or making significant modifications, as well as to comply with the GPL.